This simple cottage stands as a testament to the workers who made their lives on the pastoral properties of the Limestone Plains. Originally built for the head shepherd of Duntroon estate, it is preserved as it was in the time of the Curley family who made it their home from 1913 to 1995. The first shepherd’s hut built at Mugga-Mugga has not survived, but like the current cottage it was perched on the gentle hillside with views of the plains below where the sheep grazed. The original four room stone cottage lies at the heart of the building. Extensions were added around it in the 1860s including the slab bedroom and verandah at the front, and the kitchen and dining room at the back. Further additions were made in the 1950s and 60s. Kitchens were often separated from the main house as a precaution against the spread of fire. At Mugga-Mugga the two parts of the house are linked by a breezeway covered with corrugated iron and chicken wire to give some protection from the winds that sweep across the plains. The apartment attached to the main house was added to provide modern conveniences in the 1950s, after which the original cottage was not lived in. Patrick Curley became a junior shepherd at Duntroon in 1866 when he was thirteen, living as a worker on the estate first with his Irish immigrant parents and later with his wife, Annie Elizabeth whom he married in 1893. Patrick and Annie had three children, all girls and all born at Duntroon: Ada, Sylvia and Evelyn. By 1911 Duntroon estate had been acquired by the Commonwealth Government and converted into the Royal Military College of Australia. The Curley family moved to Mugga-Mugga on a cold, wet, windy day in August 1913. Their new home was relatively isolated compared to the close-knit village life of Duntroon. Shopping was a day-long excursion by buggy to Queanbeyan, 12 kilometres away. The family made the property their own, ordering wallpaper and large household items from Sydney by mail order. A vegetable garden was established near the creek, and fresh vegetables and strawberries were added to the existing quince trees and berry bushes. Mrs Curley’s realm was the flower garden surrounding the house. Lilac trees bordered the garden path and honeysuckle draped across the verandah, while flowers and bulbs provided a drifting evening perfume. The eldest sister, Ada Curley moved to Sydney in 1914 after receiving a scholarship to train as a teacher. She worked as a distance teacher before marrying Frederick Coster in 1942. Widowed, she returned to Mugga-Mugga in 1975 to live with her sister Evelyn. Evelyn Curley, the youngest sister, lived most of her life at Mugga-Mugga. She worked in the accounts office of Cusack’s furniture store for more than forty years, also managing the farm after her mother’s death in 1948. She had bought a car in 1926 which not only transported the family, but sometimes took expectant mothers to hospital for the birth of their babies. Sylvia Curley OAM started her nursing career in Goulburn in 1918 and also worked at Leeton, Narrandera and Gundagai. In 1938 she returned to Canberra as Sub-Matron at the Canberra Hospital. Throughout her career she worked tirelessly for better conditions for nurses and patients, often organising fundraising events to pay the costs of implementing change. After retiring from nursing she enjoyed a twenty-year long second career as an employment consultant before selling her agency in 1985. When Patrick Curley leased Mugga-Mugga in 1920 the property was 307 acres, but just five years later that was reduced to 28 acres through Government acquisition. Although Mugga-Mugga was no longer large enough to sustain a family, the Curleys wished to retain the property. The three Curley sisters fought against pressure to sell and in 1995 Sylvia Curley finally managed to transfer the lease to the ACT Government. 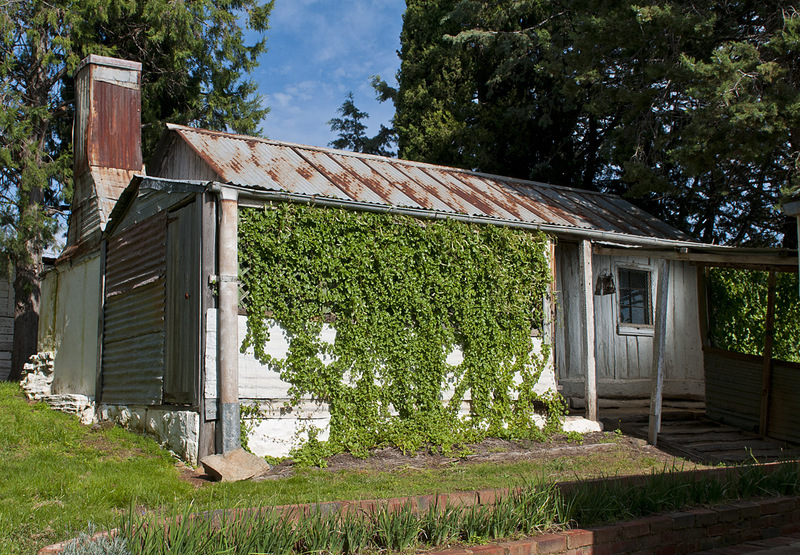 Due to her persistence, Mugga-Mugga is now preserved by the ACT Government as an historic place on behalf of the community. Mugga-Mugga has been furnished, and the gardens replanted, according to Sylvia Curley’s memories of the family’s time there. The buildings at Mugga-Mugga evidence a long tradition of ‘making-do’ with whatever was at hand. They are built of stone, slab, brick, shingles, machine-dressed timber, galvanised iron and asbestos cement. When more room was required, the house was extended, and when the family requirements changed, rooms changed uses. Mugga-Mugga cottage is a visual story of conservation and adaptation. Near the entrance to the property stands the Education Centre which was built entirely by voluntary labour and furnished through donations of materials and equipment. It is a versatile venue for learning programs, community events and private functions. Native grasses and rare native fauna still survive at Mugga-Mugga. Hands-on, interactive and discovery-based learning programs which focus on local social and natural history are offered to students on site.